Earlier this week a World Health Organization group found there was convincing evidence that processed meats are a cause of colorectal cancers. The International Agency for Research on Cancer (IARC) also concluded that there was probable evidence red meat also was a cause of cancer. The IARC report overall supports AICR’s longstanding analysis of the research on red and processed meat’s role in increasing cancer risk. The IARC report has also brought a lot of news coverage and questions. Here are answer to some of the the questions we’re getting asked the most. What was the IARC finding with processed meat? The IARC report places processed meats in Group 1: Carcinogenic to Humans, the same category as cigarettes. This category means the evidence is convincing enough that the factor is a cause of cancer. Red meat was assigned to Group 2A: Probably Carcinogenic to Humans. The evidence in this category is limited that factor is a cause of cancer, meaning it is more possible the link could be due to chance, bias or another explanation. Does this mean processed meat is as much of a cause of cancer as cigarettes? No. Although WHO now classifies both processed meat and cigarettes in the highest category of carcinogen, these classifications reflect the strength of the evidence behind them, not the level of risk. Abestos is also in this category. In some studies, participants who eat diets highest in red/processed meat experience a risk for colon cancer nearly double that of those who ate the lowest amounts of red-processed meat. But according to the Centers for Disease Control and Prevention, smoking cigarettes multiplies a person’s risk for cancer by as much as 20 times when compared to a non-smoker. Smoking increases the risk of numerous cancers, and increases the risk of dying from cancer. How much processed and/or red meat is ok to eat? IARC - and AICR – found that for processed meat, even small amounts eaten daily – 50 grams or 1 small hot dog – increases risk for colorectal cancer by 18% compared to eating none. There was also some link seen with processed meat and increased risk of stomach cancer. For red meat, 100 grams eaten daily linked to an 18 percent increased risk of colorectal cancer. Red meat consumption was also positively liked to increased risk of pancreatic and prostate cancer. How do AICR Recommendations compare to IARC findings? Back in 2007 and updated in 2011, the World Cancer Research Fund/AICR analysis of the global research concluded there was convincing evidence that processed meats and red meats were a cause of colorectal cancer. The IARC does not give recommendations: AICR does. 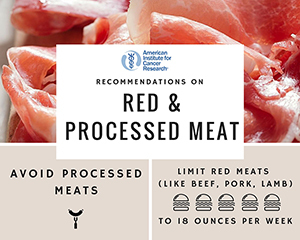 Avoiding processed meat and eating less than 18 ounces of (cooked) red meat weekly is one of AICR’s 10 Recommendations for Cancer Prevention. In general, processed meats are meats transformed by smoking, curing, salting, or adding other chemical preservatives in order to enhance flavor or preserve them. Ham, bacon, pastrami, sausages, hot dogs and cold cuts are all considered processed meat. Most processed meats contain pork or beef, but processed meat may also contain other red meats and poultry. Because most processed meats contain red meats, the vast majority of human research linking them to increased cancer risk involves these types of processed meats. Red meats come from mammals: beef, veal pork and lamb are all types of red meat. How did IARC reach this conclusion? In October, a team of 22 international experts met to review the global the evidence. The IARC report evaluated data from over 800 studies of cancer risk in humans: over 700 of these studies involved red meat and over 400 investigated processed meat. The greatest weight was given to prospective cohort studies among the general population. The largest body of research involved these meats and colorectal cancer. Why would these meats increase cancer risk? Research is ongoing as to why these meats increase risk for colorectal cancer. It may be the added nitrites and nitrates, the smoking and/or high temperatures used in some processing, or the heme iron in red meat. Cooking meat at high temperatues forms compounds that, in lab studies, act as carcinogens. These compounds include N-nitroso compounds and polycyclic aromatic hydrocarbons. Cooking of red meat or processed meat also produces heterocyclic aromatic amines as well as other chemicals that are also found in other foods and in air pollution. What’s the bottom line: Should I stop eating meat? Red meat contains proteins and important nutrients, including B vitamins, iron and zinc. AICR finds that eating 18 ounces or less of red meat weekly is not associated with a notable increase in colorectal cancer risk. Risk increases with higher consumption. For hot dogs, bacon and other processed meats, even small amounts daily increase risk. That is why AICR recommends avoiding processed meats, except for special occassion. AICR’s take-home message: by eating a healthy diet, staying a healthy weight and being active, AICR estimates that half of colorectal cancers could be prevented. Among the most common US cancers, healthy changes to Americans' diet, activity habits and weight could prevent an estimated one third of cancers, about 340,000 cases a year. Véronique Bouvard, et al. on behalf of the International Agency for Research on Cancer Monograph Working Group. The Carcinogenicity of consumption of red and processed meat. The Lancet Oncology. Published Online: 26 October 2015. The International Agency for Research on Cancer.